Can the pharmacy mail prescription drugs to the United States? How much does it cost to have my prescription drugs mailed to me? There is a $9.95 US shipping fee per patient (Additional charges may apply for cold pack items and overnight packages). All prescriptions will be authorized for a 1 year period, if indicated by the physician and will be honoured from the date on the prescription form. All prescription drug prices include prescribing fee and pharmacy dispensing fee. Why are your online prescription drug prices so low? Most patients save 30-70% on their prescription drugs, which can be hundreds of dollars per visit. Are Canadian drugs the same as what I get from my local pharmacy? If you are ordering Generic medications, they will look different. However, by law, they are required to be the bio-equivalent to the brand medications. If I don't see my prescription drugs on your online price list, does that mean you don't carry them? No. The pharmacy carries a much broader selection of prescription drugs than those listed. If you don’t see the drug you are looking for please call our office +1-866-293-3904. Please allow 2-4 weeks for delivery of your prescription drugs after the order leaves the pharmacy. If the consultation from PharmaPassport has been done there will be a $20 US cancellation fee. No. PharmaPassport is a pharmacy intermediary. 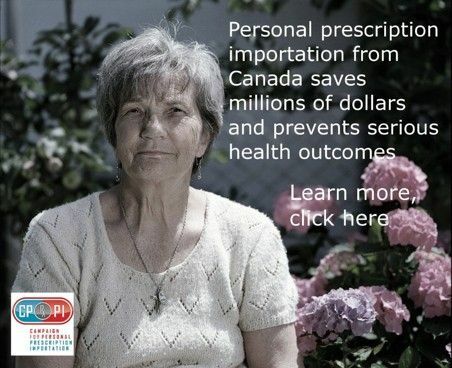 Your prescription is filled at one of our associated CIPA-certified pharmacies by a professionally licensed and registered pharmacist where it is then mailed to your home. PharmaPassport accepts personal cheques, E-checks, international money orders, and bank certified cheques. Once you have placed your order either by phone, fax, or online, we require a copy of your original prescription. We can obtain your original prescription by either you mailing it to us at 110 – 7938 128th Street, Surrey, British Columbia, Canada V3W 4E8 or alternatively our staff can request your physician to fax a copy directly from their office to ours. No. We will not dispense any controlled substance for any reason. Do you have any ordering requirements? All orders for prescription drugs must be accompanied by an original, valid prescription issued by the patient’s primary consulting physician. If the patient is under 18 years of age, the order form must be co-signed by the patient’s legal guardian. No. Although paying by credit card is the most convenient payment method, some patients do pay by money order. It should be noted that as a security measure, PharmaPassport does not keep your credit card information on file. This information is deleted from our system after every transaction. Generic drugs are the “bio-equivalent” of a brand-name drug in dosage form, safety, strength, quality, how it is taken, performance and intended use. US trademark laws do not allow a generic drug to look exactly like the brand-name drug. However, while colors, flavors and other inactive ingredients may be different, the drug must duplicate the active ingredient. New brand-name drugs are developed under a patent, giving the company the sole right to sell the drug during the patent period. During this time, a drug company charges more for a brand- name drug to recover the costs of developing the drug, which also includes research, marketing and promotion. When the patent expires, other manufacturers can begin to produce and sell generic versions of the brand-name drug. No. Currently only half the drugs on the market are available in generic form. The other half are protected under patents, allowing only one company to produce them. Do you have international shipping outside the United States? No, PharmaPassport does not ship medications outside the United States. What if I have a problem with my medication.? All health related issues should be addressed to our Pharmacy Helpline at 1-855-218-5085. Our team will get back to you promptly. The medications will be delivered by mail and will take approximately 10 to 20 business days. You don’t need to be reminded how expensive prescription drugs are. However, there is an alternative that can help you reduce your drug costs significantly-generic drugs. Generic drugs are safe, effective and save consumers an estimated $8 to $10 billion dollars a year at retail pharmacies! Absolutely. Both brand-name and generic drug facilities meet the same standards of good manufacturing practices. In fact, an estimated 50% of generic drug production actually comes from brand-name companies. These companies frequently make copies of their own or other brand- name prescription drugs, but sell them as generics.